My brother-in-law and I both have spring birthdays that occasionally fall near or on Easter, since Easter is one of those awkward holidays that likes to jump around instead of just being the same date every year. I vaguely remember using his birthday as an excuse to make this cake, which is why it has "Happy Birthday" ineptly written on it. But honestly, I was going to make this cake anyway. Allow me to take you back in time to the spring of 1998, before I had taken any Wilton cake decorating courses, but after I attended a few beginner Sugarcraft adult ed classes. I was living in the UK at the time, where they use mostly rolled fondant (aka sugarpaste) and royal icing. Well, after having a few tries at covering a cake with rolled fondant, I really wanted to have a go at working with royal icing. That's right, this cake was iced with royal icing, not buttercream. I vaguely remember adding something to it... glycerin or glucose to make the icing not quite so rock-hard when it dried, but I can't recall anything about how it tasted. I don't even know what kind of cake is underneath there, but I suspect it's a fruitcake, most likely with a layer of marzipan separating the cake from the icing. That's how they did things over there. Tidied up the lettering. Piping skills, especially writing, improve with practice. It's pretty obvious that I hadn't had much experience writing on cakes because these letters are uneven, poorly formed, and have peaks where I neglected to fully release pressure on the piping bag before pulling the tip away. All of that could have been corrected with a small, damp paintbrush, but I didn't know that at the time. Written "Happy Birthday" in cursive. Printing with icing is trickier than writing in cursive, which is why nearly all bakeries write "Happy Birthday" on their cakes in cursive. Again, something I didn't know back then. Used a different bottom border. To be fair, I didn't yet know how to pipe shells, so that's why this cake has a star border. While the stars are fine, I think small shells, beads, or even dots would look better. Left the cake board uncovered, or fully covered it. I have no clue why only the top of the cake board is covered, in pink fondant no less, ugh. The uneven, jagged edge is such an eyesore, highlighted by the shiny silver board underneath. Left off the roses. They're really out of place. I don't have as much of a problem with the overabundance of blossoms, even though their scale is a bit off, but the roses shouldn't be on there at all. How many roses do you ever see growing individually, straight from the ground, with no stem but two obnoxiously oversized leaves? Plus, the roses are not at all well made. I obviously still needed practice forming flowers, too. Colored a sufficient amount of green icing the first time. The mismatched green was not intentional. I messed up something--probably the letters--and tried to fix it, screwing up the icing underneath in the process. I tried to blend the colors by putting the darker green elsewhere around the cake top, but I really should have scraped the whole top off and started again. Here's a pro tip: always color enough icing required for the job. Trying to match colors if you run out is impossible. You might get pretty dang close, but usually only after wasted time, energy, and a fair amount of frustration. That was a lesson learned the hard way. Left off the pond. It's way too small. It's really more like a puddle. Yet another sizing/scale issue. 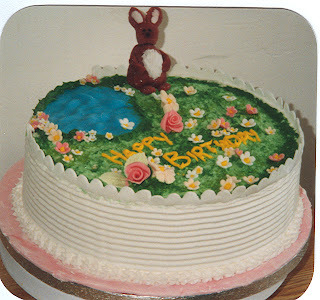 If I had to make this cake today, I'd either lose the pond altogether or make it closer to half the size of the cake top and add some wee ducks or something. Another thing about the pond: I made it out of blue rolled fondant. I tried to add a realistic touch with the bumps, but I should have marbled some blue and darker blue fondant for it. Using blue piping gel to make the pond would be an even better option. Made a different top border, or just left the cake without one. I don't like the top edge of this cake. That border is meant to be like a garden fence or something, which I guess is why I didn't put it around the pond. I made it with a frill cutter, and you can clearly see where it's not attached cleanly and is leaning. Used fewer blossoms. I got a bit carried away with my blossom cutters. This is definitely a case where the concept of "less is more" would have been well applied. Oh, and I should've only used the smaller blossoms on this cake, again with the scale thing. The bunny isn't perfect, but I have a thing for rabbits so I'm going to leave it alone. My modeling skills could still use a lot of work. I'm willing to admit my limitations there and focus on what I can improve. I don't like how he looks sad, but I can't really blame him. I'd want a prettier cake to sit on, too. The nice thing about making cakes for friends and family is that no matter what they look like, they're always well received. Nobody complained about any of the above at the time, and I seem to recall that I was rather proud of this cake back then. Now I look at it and wonder what I was thinking. What do you think? Is there something I missed or anything you'd do differently? If so, please leave a comment letting me know. If you made me a cake, I'd love it! Following you from the Sunday Blog Hop. Check out my blog at http://east9thst.blogspot.com. Yes, you're right. No matter what your cake will look like, they will see nothing but the effort you exerted in making it. I love cakes and I often make my own for any occasion.